Jay Gee's Nook: Cute Cards! Thanks for popping in today. Just a reminder that you still have time to enter our current challenge - we would love to see your creations. The link is on the side bar and the challenge is open to everyone. So, I have some lovely cards from the DT to show you. Could you find a card any sweeter than this! Joy has used this gorgeous La La Land stamp 'Sweet Dreams Marci' and her colouring is just superb. Ange has used Pure Innocence 'Warm Fuzzies' for her card and it is just too adorable! How cute does she look in that little outfit and the hand stitching is a wonderful touch. The current challenge at Lawnscaping is Polka Dots and I wanted to do something a little different. I hope this qualifies :) My first thought was someone who is sick and covered in spots. I have used the raccoon from Lawn Fawn's 'Critters in the Forest'. The sentiment is hand written and the ambulance was a digi image I found and coloured with pencils. 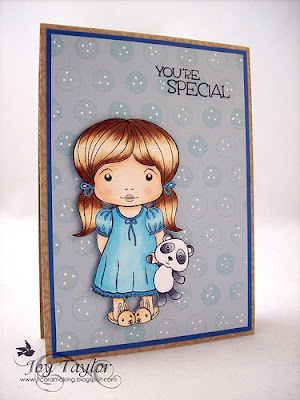 Your card Judith is super adorable, love your hand written message and that sweet little Raccoon...just gorgeous! I very RARELY have the courage to put my very own handwriting to a card... but the whole sentiment... you are super clever! Hope your 'sick' raccoon gets well soon! He is just too cute. 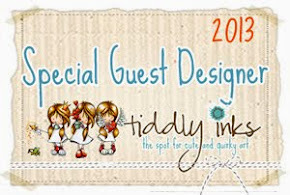 You need to create your own stamps with your handwriting...amazing! Your card is absolutely adorable! lovely work ladies and woooow! love your fun handwriting! So sweet and cute cards. Love the handwritten sentiment in your card Judith. This is so original and creative! So creative on your card, what a great idea! Made me smile Judith love the spotted racoon and great printing. Love your handwritting and these are all too cute! Oh WOW!!! I love all your cards but that Raccoon is my absolute favorite - how clever and CUTE!!! SUPER!! !